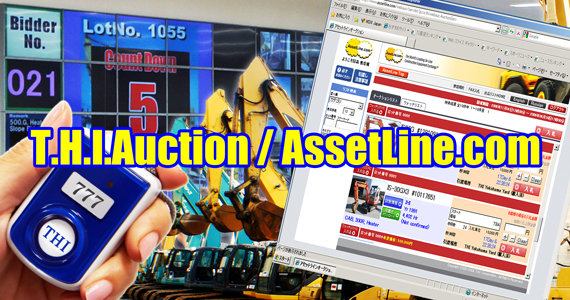 This is the used construction machinery auction group and trading division of THI. It owns an expansive yard in Daikoku, Yokohama, in which it deals with a wide range of products including construction machinery, cranes, generators, trucks, and various parts. We have our own auction hall right next to our office. The auction hall is fully equipped with our wireless bidding auction system, and we provide a great environment for all the visitors from all over the world. The Trading Company currently hosts four types of auctions including premier auctions. The T.H.I. trading Company has introduced a unique inspection system to evaluate values of used construction machinery, which used to depend on experiences and intuition of suppliers and buyers. Under this inspection system, an independent body examines each product to ensure fair and accurate measurement of the value of each product, allowing us to best serve both suppliers who wish to sell products at the highest possible prices and buyers who wish to buy the best possible products at reasonable prices. The inspection system also helps minimize huge distribution costs incurred at the time of selling and buying used construction machinery. It also significantly shortens time from bidding to payment, and thus optimizes cash flow for suppliers. The T.H.I. Trading Company has recently bean accreting great attention within the industry. The high repeat rate of transactions proves that the company is slowly but steadily building trust with customers, and that the number of regular customers is gradually on the increase.